`Truth' is a difficult subject in a pluralistic culture, and `the truth' is even more challenging. Yet the preacher's call is to be a speaker of truth - the truth of God in Jesus Christ. What does it take to speak the truth faithfully as a preacher of the gospel, for that truth to be heard, and for words and ideas to generate actions and build relationships? Samuel Wells has learned that speaking the truth means telling the Christian story alongside the contemporary secular story. It means helping your hearers perceive both the harmonies and the dissonance between the two. It means inviting them, with both conviction and humility, to decide how their own story is going to be shaped by this truth. In this volume, he reflects on the practice of speaking about God, faith, the Bible, discipleship, resurrection, salvation, politics and truth, and on preaching that resonates in particular contexts. It is a book to encourage and give confidence to all preachers, and preachers in training. 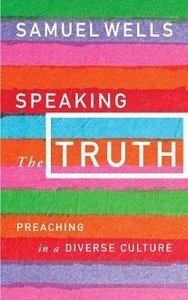 About "Speaking the Truth: Preaching in a Diverse Culture"
The Reverend Dr. Sam Wells (Ph.D., Durham University) has been Dean of Duke University Chapel, North Carolina since 2005. His pastoral experience before coming to Duke included a spell as a community worker in inner-city Liverpool. He served four parishes as a Church of England priest from 1991-2005.